The Nissan Murano is a stylish mid-size crossover SUV that pushed shoppers toward curvier tall-riding vehicles and set a new style direction. Available in a slew of models—S, SV, SL, and Platinum, the Murano ranges from affordable to downright luxurious. With the Murano, Nissan has an all-weather family utility vehicle that hits a sweet spot for many shoppers: it has a relatively thrifty V-6 engine, a continuously variable automatic (CVT), and available all-wheel drive. The latest iteration of the Murano arrived last year with a very design-focused shape and some additional innovative features. 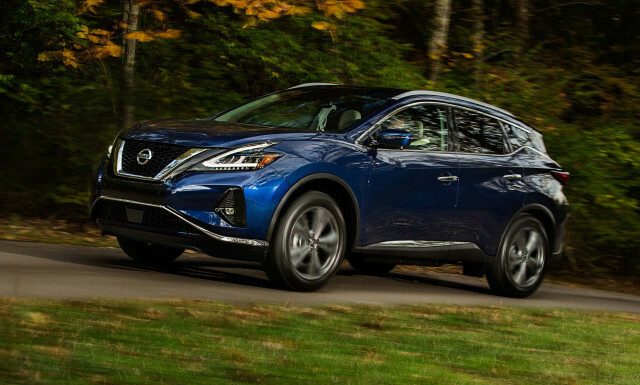 For 2019, Nissan updated the Murano's styling and replaced its infotainment software. With a major 2015 redesign, the Nissan Murano received striking new looks and a much-improved interior. A sweeping hood ties to a roofline that "floats" over a very small, third side window in the pillar. The tailgate is sharply raked and highly sculpted, with a long trailing roof spoiler at its top. Inside, it's all about comfort and luxury, with a long console that extends past the front seats to offer rear passengers their own charging options. The Murano's powertrain is familiar. 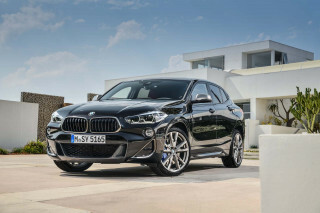 The SUV offers a 260-horsepower, 3.5-liter V-6 engine developing 240 pound-feet of torque, CVT, and either front- or all-wheel drive. Eventually, the Murano may get the hybrid technology from the Pathfinder and Infiniti QX60. The Murano has the same "zero-gravity" seat design as the latest Altima and Maxima. It uses dense foam for comfort over long trips, which Nissan claims comes from NASA's fatigue-free neutral seating position. Nissan also says this Murano is supposed to be able to swallow four large suitcases with the rear seats in place. The IIHS rated the Murano with its Top Safety Pick+ award before changing the criteria to include headlight efficiency and automatic emergency braking. Federal testers give the all-wheel-drive version five stars overall, four stars to the front-drive model. Nissan also offers a full suite of standard and optional safety features, using data from as many as three separate radar systems and four cameras. Available safety systems include adaptive cruise control, blind-spot monitors, and a surround-view camera system. The Murano also offers a long list of available features, including keyless ignition, leather upholstery, a heated steering wheel, heated seats all around, and cooled front seats. Memory for the driver's seat, steering wheel, and mirror positions is also available. 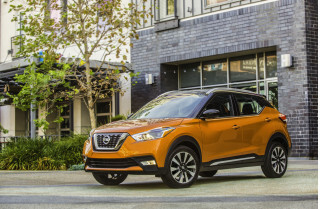 The NissanConnect infotainment and connectivity system is included, incorporating both navigation and mobile-connected apps. Premium Bose AM/FM/CD audio system with 11 speakers, HD Radio, and satellite radio are also on the options sheet. For 2017, Nissan took the unusual step of offering a half-year model (officially a 2017.5) of the Murano that included broader Apple CarPlay compatibility and available automatic emergency braking. The first-generation Murano model, sold from 2003 to 2007, had a pleasantly edgy, urban-friendly shape. Sized like its main competitors, the Ford Edge and the early Toyota Highlander, the Murano took the styling kudos. Mechanically, it also had an edge, with better steering and a more nimble feel, thanks to its family-plan architecture based on Nissan's well-received Altima four-door. The first Murano's interior offered five-passenger seating and a decently roomy cargo area as well. Safety proved very good, with the crossover earning the federal government's top ratings for front and side-impact protection (under test criteria that have since changed). Power in the first-generation Murano came from a 245-hp version of Nissan's corporate 3.5-liter V-6. The power flowed to front- or all-wheel drive via a CVT. While CVTs can improve fuel economy, they also generally add to powertrain noise and can be slow to respond to driver inputs. The Murano's CVT was easily the least attractive part of its package, though later versions have shown improvement. After Nissan skipped the 2008 model year altogether, the 2009 Murano didn't differ too dramatically from the original underneath. The design changed nearly all for the better, though, save for a toothy grille slotted in up front. The running gear migrated to the fourth-generation Nissan Altima platform, and the powertrain was updated to 265 hp (it's now rated at 260 hp). The CVT was upgraded to include programmed "gears" that gave the transmission the feel of an automatic gearbox, with paddle shifters enabling driver choice of the ratios. Nissan expanded the Murano family for 2012 with the unusual CrossCabriolet convertible. Nissan also spun off a new 2013 Pathfinder seven-seat crossover along with a similar Infiniti JX35 seven-seater—which got a new name, Infiniti QX60, for 2014—all from the same basic architecture. For 2013, Nissan added a few features and options, and made several active-safety systems available, including object detection, blind-spot monitoring, and lane-departure warning. After very weak sales, the Murano CrossCabriolet was dropped at the end of the 2014 model year. -noisier than my 2003 tundra. Figured it would have less road noise from reviews I read. It's ok but not quietest SUV I have been in. I would recommend this car. Biggest beef is wish it was quieter.